Urban Concepts, with offices in Los Angeles and Atlanta and a staff of professional planners, attorneys and architects, is founded on the basis of 30 years of experience in the fields of land use planning, entitlements and commercial architecture, combined with a broad knowledge of community and jurisdictional issues. This unique perspective provides Urban Concepts with a solid background in the regulation, design and construction of the built environment. In recent years, Urban Concepts has emerged as a nationally recognized leader in entitlement issues effecting property rights in many areas of the country. The firm is actively engaged in entitlement questions from coast to coast, bringing the firm into contact with over 200 local jurisdictions annually. Our recent work has focused on office, industrial, hospitality and retail projects in California, Hawaii, Colorado, New York, Florida, Massachusetts, Illinois and Texas, as well as Puerto Rico and the Virgin Islands. Pairing our technical expertise in building construction with our knowledge of land use regulation, Urban Concepts has come to be recognized as experts in the field of Due Diligence. On that basis, Urban Concepts has emerged as a nationally recognized leader in the preparation of Entitlement Evaluation Reports which assess the land use regulatory framework impacting properties slated for sale or acquisition. Urban Concepts has been retained to investigate the entitlement status and code compliance of a number of landmark structures, as well as to review over $10 billion worth of portfolio transactions nationwide. Our company also provides Property Conditions Reports as well as ADA complince reviews. Urban Concepts is experienced in processing a wide variety of jurisdictional approvals, ranging from local Building & Safety permits to Federal Aviation Administration clearances. Knowledge of the system and experience in many different locales positions Urban Concepts as the most effective consulting team when it comes to dealing with regulatory agencies. The firm's effectiveness is enhanced through Bill Christopher's experience as Chair of the Board of Zoning Appeals for Los Angeles, and his work with local jurisdictions and neighborhood associations. Urban Concepts believes that the local community is an important consideration in any development project that is subject to discretionary review. Through a dialogue, we can assist in defining development strategies which meet the economic needs of the project while mitigating some of the concerns of the affected neighbors. Toward that end, Bill Christopher has served on the Citizen's Advisory Committee for the Study of the Center's Concept and as President of the Westside Civic Federation. To foster participation in the discussion of communities, Bill is co-founder of the Citywide Alliance of Neighborhood in Los Angeles. Urban Concepts' masterplanning work is based on a broad knowledge of successful development techniques and building types, grounded in environmentally sound urban theory. That practical expertise is then combined with our knowledge of the approval process to provide our clients with the optimal available design and planning options. Urban Concepts maintains a strong commitment to the urban context. This commitment is reflected in both our projects and our participation in design issues that impact the look of the overall City. Hence, Bill Christopher has been an integral part of the Los Angeles Design Action Planning Team studies of various locations around Los Angeles. Bill was also responsible for the creation of standard Design Review Procedures in the City. Bill Christopher, principal with Urban Concepts, has directed and participated in many recognized projects around the world. Among his efforts are the Neiman-Marcus store in San Diego; First Federal Square in Santa Monica; the Empress Pavilion Restaurant in Chinatown and the Thomas & Mack Special Events Pavilion in Las Vegas. 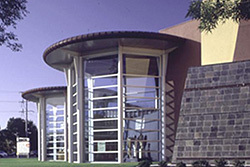 In other areas of the world, Mr. Christopher has been heavily involved in the design and construction of Montgomery-Washington Tower in San Francisco; the Kun Lum Hotel in Bejing, China; the Hyatt Regency Jeddah, Saudia Arabia; the Banco Di Occidente in Guatemala City and the Hyatt Bumi in Surabaya, Indonesia. Urban Concepts also features renovation projects and tenant improvement work in many areas, including the 9911 Pico Building in West Los Angeles, Shoppers World in Baldwin Hills, Pacific Bell's Madison Complex in Los Angeles and the First Professional Bank Computer Center in Santa Fe Springs.